There is no better documentary about the pain and sacrifice of making a film than “Hearts of Darkness: A Filmmaker’s Apocalypse”, which is now available on DVD for the first time. The documentary which chronicles the sordid history of the making of “Apocalypse Now” is a film worthy of the greatness of its subject. A remarkable amount of on-location footage, candid audio recordings and modern reflections of the time from the participants make for an all-access pass into the hellish process of making a masterpiece. At the top we’re privileged with an interesting tidbit of info that the film was first proposed as an American Zoetrope feature for George Lucas to direct. A script had already been written by Zoetrope pal John Milius, and was to be filmed in 16mm during the Vietnam War. That suggestion didn’t fly with the studios, and so Coppola had to wait until he had the clout from “The Godfather” films before taking another shot at it. 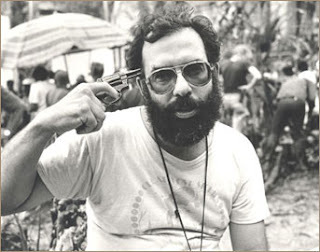 After the backstory of the development of the project, the documentary is taken over by the footage shot by Coppola’s wife Eleanor who traveled with the crew to the Phillipines location. "Apocalypse Now" turned out to be a cursed production which lasted over a year, survived a hurricane, a near-death heart attack from Martin Sheen, the firing of its lead actor, and the numerous contemptuous antics of Marlon Brando. Directors Bahr and Hickenlooper effectively use a clever voiceover track from Orson Welles - a similar maverick independent who also tried to film Joseph Conrad’s novel in 1940, before “Citizen Kane”. That project was too daunting for Welles but we have the narration from his Mercury radio program which acts like an ominous ghost haunting Coppola’s film. Though Eleanor Coppola doesn’t get directorial credit, she should. Her candid audio recordings which were made without Coppola’s knowledge offers us true fly-on-the-wall access to a great artist at work. We get to hear the indecisive ramblings of Coppola near the brink of insanity. He honestly confesses his film will be no good and questions the risk he’s taking in making a ‘pretentious’ film. There are many profound themes that emerge from the material without manipulation from the filmmakers. The notion of war and filmmaking being linked metaphorically comes true when the Philippine Army takes away Coppola’s helicopters in the middle of shot to fight off some Communist insurgents. Amazing. The film is also about ego and excess. His description of how he wants the set designer and casting director to fill out the French Plantation scene is grossly egotistical. And look at the opening shot of an unflattering Coppola, shirtless, so heavily bearded you can’t see his face, and frantically twitching. He resembles the character of Kurtz himself - out of control, out of touch with reality and without an end-goal vision. Sometimes great art comes from the insane mind. Coppola was never committed, but he certainly lost years of his life making the film. Indeed “Apocalypse Now” became an unrivaled masterpiece. One thing missing is Coppola’s opinion on the finished film. I suspect he hates it, probably because it brings up these tragic memories which are nightmarish to him but fascinating to us. Enjoy. This is probably my favorite doc of all time. As a filmmaker, there is nothing more fascinating than peeking behind the scenes of a classic, especially when it's as unflattering as this. My favorite scene has to be Coppola ranting over the phone after Sheen's heart attack, "If Martin dies, no one says he's dead UNTIL I SAY HE'S DEAD!". Crazy. I also like the Welles' voice over from his radio play, especially when he describes Kurtz as a scrawny emaciated man, followed by a shot of an immensely tubby Brando. Very funny. I'm glad to hear Hearts of Darkness finally available on disc, which is one I will definitely run out and purchase. I've been waiting for this to become available on DVD and was dissappointed when the third version of "Apocalypse" came out without this attatched to it, although I suppose it is a case of ownership. As you can see from my bio I trained in theater at Coppola's alma mater Hofstra where I was also the president of the theater group he founded the Spectrum Players. To this day I still do puabahs before every theater performance. I always refer my actors to this film where they can see Coppola himself lead the cast and crew in puabahs before the filmming begins.